I am a member of the St. Louis Master Gardener program and I do some of my volunteer work at Litzinger Road Ecology Center. 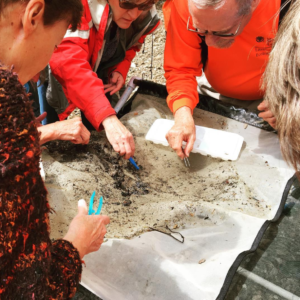 LREC offers enrichment and training sessions for volunteers to increase our knowledge. Sometimes we get to take part in fun “crafty” activities that have an ecological benefit. 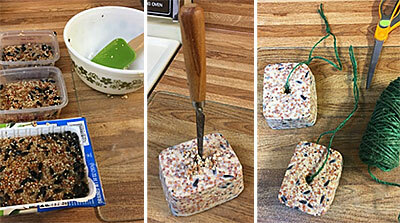 We made bird suet cakes one day at LREC and later I also experimented with making some at home. Feeding birds in our backyards is a way to get a good look at birds up close while providing them with a nutritional food bonus to make their lives a little easier. Suet and fats are good foods for many birds when it is late winter and natural food sources are low – fats are also most likely to attract birds who eat a lot of insects, the kind of birds you particulary want in your yard to provide free pest control services. At the time I am writing this we may be done with freezing temperatures during the day but we may still have some below freezing temperatures at night. You know how our weather is in the St. Louis area – it could be 85 degrees or 25 degrees tomorrow (or both) and no one would be shocked! Suet and fats can melt and turn rancid in warm weather but if you double-render the fat you can place suet outdoors in temperatures over 70 degrees F, according to the book “The All-Season Backyard Birdwatcher” by Marcus H. Schneck. Before beginning to heat the fat, please read the safety precautions in my article Make Old Wax Candles Into New Candles. Any safety issues that might come up while melting fat are pretty much the same as with wax. I’m not sure if the melting temperatures are the same. Keep a close watch on your fat to make sure it doesn’t overheat. If you’ve ever had an unexpected flare-up from hot bacon grease you know hot fat is something to treat with care! In my example I used bacon fat and some beef fat trimmings that the butcher at Whole Foods gave to me. I had gone to Whole Foods with the intent of buying some suet but they didn’t have any. Suet is a type of fat that comes from around the kidneys. Just plain beef fat will work too. I experimented with a couple of different ways of rendering the beef fat. First I chopped it into smaller pieces then I put some of it in a food processor to partially grind. A meat grinder would be better for this but I don’t have one. I put the ground fat in the double boiler to melt down. A double boiler is used to heat things that scorch or burn easily. At home many of us use such a setup to melt things like wax and candy. Place a saucepan on top of the stove and partly fill it with water. Set a glass heat-resistant measuring cup containing the fat in the pan of water and slowly heat the water until the fat melts. I also experimented with putting some fat pieces into a glass temperature-resistant measuring cup and microwaving the pieces for about a minute to a minute and a half at a time. 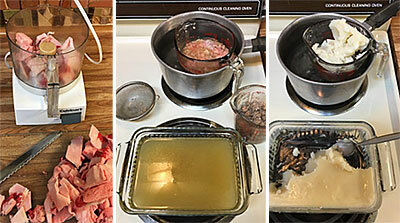 Either way the fat melted fine and I strained out and discarded the tough pieces and little meat pieces that were left behind and poured the fat into a glass dish to harden. I let the fat cool until it was hard, then I re-melted it. 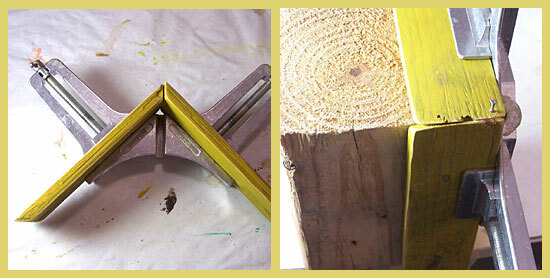 The hardening and remelting makes it double-rendered and ready for warmer spring temperatures. 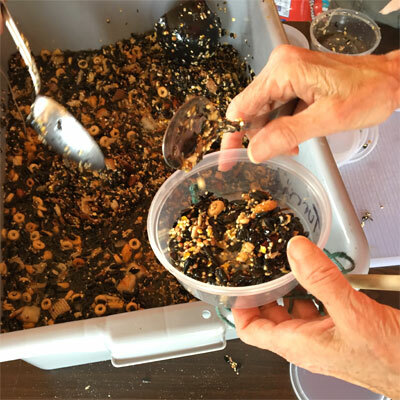 After the fat is melted, you can mix things in it that are tasty treats for birds – leftover baked goods, grains, nuts, chopped dried fruits, cereal, dried mealworms, and of course, bird seed. I molded my cakes in cleaned used food containers and popped them out after they were hard. You can buy pre-made suet cakes (at Schnarr’s!) that are made to go into a pre-made metal mesh holder with a hanger. When you make your own suet cakes, you have to work out a way to hang them. I drilled holes through the middles with a long thin knife and threaded twine through the holes to tie the cakes in place outdoors. 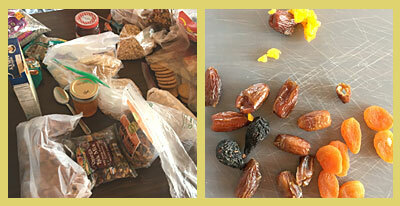 The remaining photos were taken at Litzinger Road Ecology Center on the day we made suet cakes. We were all asked to bring in stuff from our pantries to add to the bird food mixture. At LREC, we had a quantity of donated food containers to use so we made holes in the sides of them to accomodate a hanging string. 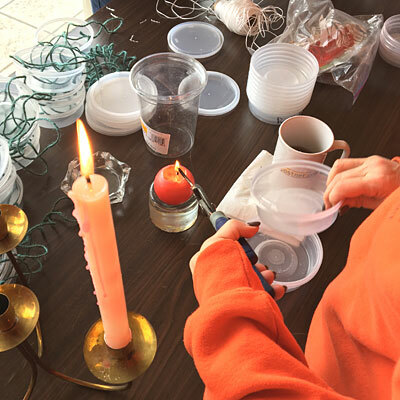 You can easily make holes in plastic by heating a nail in a candle flame. Hold the nail in a pair of pliers to keep from burning your hands and be careful around open flames! We made knots in the strings to keep them from slipping through the hole. Before filling the containers with food mixture, for extra security we pulled the stings in slightly so the fat mixture would harden around the string and help hold it in place. After filling with food mixture, all we had to do was wait for the fat to harden. 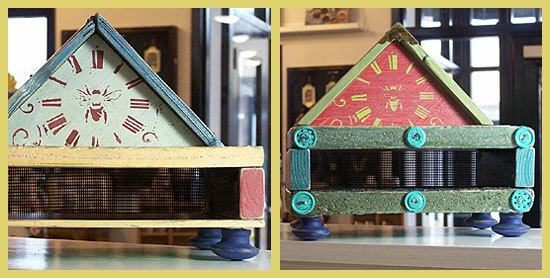 Then our suet feeders were ready to hang outdoors! This is the time of year when small lakes, ponds and water gardens sometimes get green “pea soup” water or mats of algae floating on the surface. The limiting factors for algae growth are mainly food and sunlight. If you can reduce the amount of sunlight and nutrients getting into the water, you can reduce algae growth in your water feature. First lets look at possible food sources for the algae. Is runoff from your lawn or garden getting into the water? Try reducing the use of artificial fertilizers in those areas. If that is not possible, try creating a rain garden or bioswale in a place that interrupts the water before it reaches the body of water you want to protect. Plants will help take up the extra nutrients before they pollute your water feature. Are leaves or other dead plant material decaying in the water? Remove plant debris that falls in ASAP. If you have fish in your pond, do you have too many fish for the size of your water feature? Do the fish get too much food? If you overcrowd the water or overfeed your aquatic animals, you will help feed algae as well as cause health problems for the animals. Uneaten food in the water is even worse for water quality than fish waste because it has more nutrients in it. Birds are another source of waste in the water. I have a small water garden specifically intended to attract birds. They bathe in it and sometimes dunk their food in the water to moisten it. Despite that activity, my water garden contains clean-looking, clear water. If you want wild birds to make use of your water feature, that doesn’t automatically mean you have to put up with water that looks like pea soup. Once you have addressed the sources of excess nutrients in the water, I recommend you next take a look at how the water is being filtered. Aquatic plants are great natural filters. Add more marginal and submerged plants to the water, and you will help starve out the algae. Areas around the water that support bog or marsh plants not only help filter water but they give your water feature a more natural appearance. Artificial filters* are a great help too. I use one in my small water garden and it plays a role in keeping my water garden clean. There are lots of different kinds of filters. Follow the recommendations of the manufacturer of your filter for proper maintenance and cleaning schedules. If you have a type of filter that uses media that you rinse out, rather than replace, rinse the filter media in chlorine free water (such as old pond water that you’ve removed during water changes) so that you don’t kill the beneficial bacteria that live in the filter media. 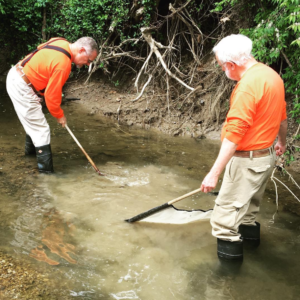 Beneficial bacteria that break down waste grow on just about every surface in the water, but are most numerous where there is porous material and the water flow is swift – conditions that exist inside a filter. These bacteria are what make most filters function. This is called biological filtration. Other types of filtration include chemical and mechanical. Many filter designs, including the sponge filter that I use, combine mechanical and biological filtration. For example the sponge picks up large particles and takes them out of circulation while the bacteria that live in the tiny holes in the sponge digest the water pollutants and turn them into less toxic substances. It’s a good idea to know which kind of filter you have and understand how it works – that will help you understand what to clean and when. For example if I squeeze out my filter’s sponge in a pail of chlorine-free water to remove the debris it’s collected and put the old sponge back in the filter, I’m doing a good thing for the water quality. If I dunked the filter parts in chlorinated water and scrubbed off the thin film that is all over the parts, I would be doing harm to my water quality because I would be removing beneficial bacteria that are helping and not in the way. This is why aquaria and bodies of water that are established and “seasoned” are much easier to keep clean. In the aquarium world, this “seasoning” is called “cycling”. 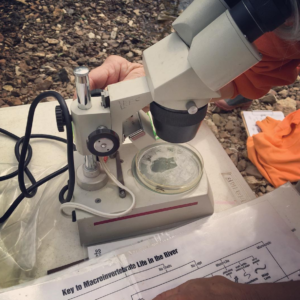 If you are not familiar with cycling, learning more about how it works will help you troubleshoot your water quality. Don’t forget – the rinse water from cleaning your filter media makes wonderful plant fertilizer! If you’ve done everything you can to reduce the amount of nutrients in your water, next see if there is a way you can cut down on the amount of sunlight that reaches the water. If you have a small water garden like mine that is portable when empty, you can move it from full sun to part shade and use it for growing part-shade aquatic plants. If you can’t move your water feature, what can you do? Grow some plants around the edges of the pond that will help cast some shade on the water, if not for a whole day, just part of the day. You could use small trees, bushes, rushes, big annuals with large leaves and many others. Choose plants that can tolerate waterlogged areas or having “wet feet” or add some container plants around the margins. Water lilies, lotus, water lettuce, water hyacinth, duckweed and many other lovely plants either float right on the surface or emerge at the surface and help provide shade. If you are experimenting with plants that are not native, make sure they don’t get discarded in natural bodies of water. Some floating plants can cause other problems if they cover the entire surface of the water – no more than 50% of the water surface should be covered with plants. Duckweed is an example of a plant that sometimes can blanket the entire surface. This inhibits the exchange of gasses at the water’s surface and can compromise the amount of oxygen in the water. Remove the excess growth and use it as mulch or put it in the compost! That way any overgrowth will be a boon to your garden instead of a nuisance. Speaking of oxygen, if possible try to increase the amount of oxygen in the water. The addition of a bubbler, fountain or waterfall will help agitate water at the surface and bring in more oxygen. Oxygen is important for the health of the aquatic community as a whole, including the aerobic bacteria that are doing most of the work of keeping the water clean. 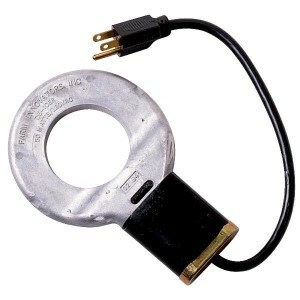 At Schnarr’s we sell pumps* that can be used to power waterfalls and fountains. Small fish like minnows eat some of the algae and as a bonus keep mosquito larvae out of the water as well. Their small size means they produce small amounts of fish waste. Koi or goldfish are wonderful animals with many good qualities but they produce a lot of waste and need a lot of space and clean water to thrive. A friend of mine struggled with algae in his koi pond until he added a UV sterilizer to his recirculating waterfall. It was effective. He might have been able to avoid the expense by stocking his fish at more reasonable levels but he liked a LOT of fish and was willing to do the extra maintenance required. You can purchase an algaecide* to kill the algae. This will likely be a short-lived solution because the dead algae will decay and add more dead organic matter to the water which will probably cause either another outbreak of algae later, a drop in oxygen, a toxic ammonia spike or all of those conditions. Addressing the reason the algae is there in the first place is more effective in the long run but it may take some time to notice improvement. An algaecide might work well in a situation where you need a quick fix now but later conditions are not that important. I don’t recommend you use algaecide if you have fish or other aquatic animals that you care about in the water because a sudden deterioration in water quality can cause a die-off. Algaecide makes more sense in something like a small decorative water fountain or other feature that is not intended to support aquatic life. If practical, perform a 20% water change while vacuuming the bottom with a gravel washer device. This is very easy to do for small water gardens like mine, not possible in a large pond or lake. Use of Clear-Water Pond Clay* 24 hours before you vacuum the gravel will help small particles fall to the bottom where they can be picked up. Clean filter medium if you have a filter or add a filter. If practical add a bubbler or some device to agitate water surface. If you have floating mats of “hair” algae, rake off if possible and use in compost. Inoculate the water feature with a live culture of beneficial bacteria – this may not work if you are using a UV sterilizer or if the water is not well aerated. You can buy wet and dry bacteria cultures designed for ponds or request some used gravel from a friend who has an established freshwater aquarium or pond. Get some terra cotta plant pots* and scrub well with plain water, no soap or bleach. Do not use if they have ever been used with chemicals that are not pond safe. Fill plant pots with rinsed lava rock*. Place pots in pond and stack almost to water level to use as a plant stand. Set a planter* containing aquatic plants on top of the stack. These could be fully aquatic plants or bog plants as long as the roots can reach the water to take nutrients out of it. Use pots to adjust the water level to what the particular plant needs. If you don’t want to bother with plants, just add permeable, pond-safe containers of lava rock and if possible place them in a spot where the current is faster. Lava rock is a terrific natural filter medium because it contains many tiny holes for beneficial bacteria to live. Give the bacteria a good home and they will do a lot of your filtration for you. Late winter and early spring are good seasons to attract desirable bird species to your yard. Birds are not brooding eggs yet because they need to wait until later in spring when there is enough insect food to feed their young. However, they are now engaged in, well, getting engaged! In other words many birds are scouting out nest sites and selecting mates if they haven’t done that already. You can entice birds to think your property is a good place to raise families by managing it with good bird habitat in mind – some ideas are in my previous article “Gardening for the Birds”. Some of the most sought-after backyard bird species are heavy insect eaters. Many dried and live mealworms are purchased to attract Eastern Bluebirds. Although they tend to be rare in urban and suburban areas, I saw one at the Litzinger Road Ecology Center a couple of weeks ago, so I know they are present in Ladue in places where the habitat is suitable. Dried mealworms, which can be purchased at Schnarr’s, are more convenient than live mealworms and possibly more acceptable to those who are squeamish. If you would like to try raising your own however, I’ll tell you how. It’s so easy, I started raising mealworms by accident! For years I’ve raised plenty for my pet birds, newt and fish and there are enough left over to share with the outdoor birds also. Mealworms are not actually worms. They are larvae of a species of beetle, usually Tenebrio molitor L. My indoor and outdoor birds will happily consume all three forms of the beetle – adult, pupae, and larvae. When you purchase live mealworms in a store, they are usually larvae only and they are refrigerated to slow down their development into pupae and adults. To get adults who will lay eggs and make more mealworms, you need only to store the larvae at room temperature and give them food and a little moisture! To begin, acquire a container that is steep sided so the adult beetles can’t escape. An unused 10-gallon aquarium is ideal. Place an inch or so of some kind of “meal” product on the floor of the aquarium. I use a combination of oatmeal, chicken food, and flaxseed meal. These creatures are not that picky so you can use what is cheap and available – I’ve seen an exhibit at the zoo of mealworm beetles consuming styrofoam! Place a couple of pieces of bark or wood on top of the meal for hiding places. You don’t need a light, they don’t like it. I only use a light to see when it’s time to harvest some larvae. Nor do you need a lid because the adult beetles don’t fly. Buy a container of live mealworms and dump the contents into your mealworm container. Every couple of days, add a little more food and something with moisture that the larvae can “drink” from. Good choices are a piece of carrot or potato, or leftover pieces and rinds from fruits and vegetables that aren’t too odoriferous. You can also buy a special gelatin-like product that is designed for “watering” crickets. Avoid a dish of water because the insects might fall in and drown. If the substrate gets wet and moldy, replace with dry substrate. When nutritious foods are fed to a prey animal like mealworms and crickets, that is called “gut loading”. In theory, the better you feed your mealworms the more nutrition you’ll be passing along to the eventual bird consumers. Cat food contains protein and amino acids that are very good for insectivorous and omnivorous birds. My two pet European Starlings’ staple food is made from 1/3 chicken food and 2/3 cat food. They are picky about what size food particles they will eat so there are always lots of leftovers that are given to my mealworms and quickly devoured. 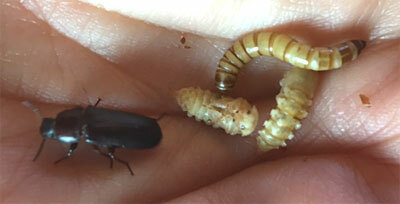 Eventually the larvae will develop into adult beetles that will lay eggs. Lift up the wood pieces periodically to see how many insects are hiding under there. When you think you have a high enough population to start harvesting, go ahead and take some. You will get a feel for how many you can take and how often over time. 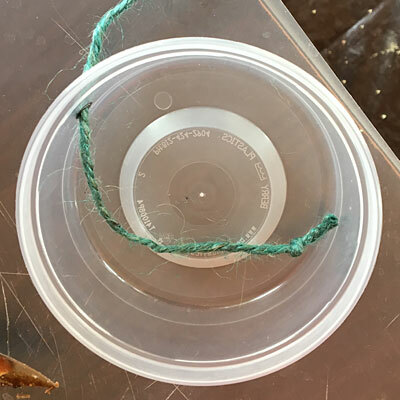 If you get a fruit fly infestation, try moving the mealworm container to place where a few tiny flies are not that bothersome, like a garage. You can also set up a fruit fly trap (available at Schnarr’s) near the mealworms to catch the flies. Raising mealworms may seem “gross” at first but it’s a great way to see and teach the life cycle of insects. 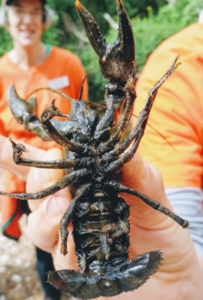 If you have young family members they might be intrigued by this activity and develop an interest in animals and science. 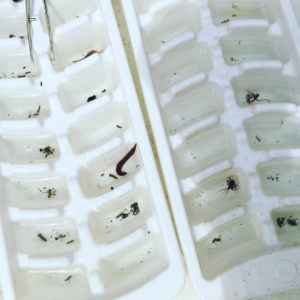 I started aquarium keeping when I was eight years old and I already liked bugs at that age. Besides fish I loved to keep lizards, toads and praying mantises. Seeing the mealworms I bought for my pets turn into pupae was really interesting! If you give a little squeeze to a pupa that is alive it will wiggle, which is an amazing thing for a kid to see! I can tell by the amount of food and feeders that we sell that Schnarr’s customers love their backyard birds! Many of us will encounter at some point a bird that is sick or injured or a baby that appears to be abandoned. Right now some birds are starting their second brood of the summer so baby bird season is not over yet! Baby birds are very vulnerable if they fall or are pushed out of the nest. If you feel compelled to intervene, I totally understand why – that’s how I came to be living with two European Starlings – it’s a long story! Having been through the situation of finding a baby bird more than once, I’ve done a lot of reading and learning from experience and here is what I recommend. First determine if the bird is a nestling or a fledgling. A nestling will not be fully feathered and will not be able to run away. It needs to be back in a nest ASAP. Try to put the bird back in the original nest if you can and if you know the parents are alive. It’s a myth that the smell of humans will cause the parent birds to abandon it – most birds can’t smell. Sometimes it’s not possible to put the bird back in the original nest – you can’t find it, you can’t reach it, or it’s been destroyed. If that’s the case you have the following options. One plan is to make a makeshift nest and put it in a place where the parents can find it and it is safe from predators. 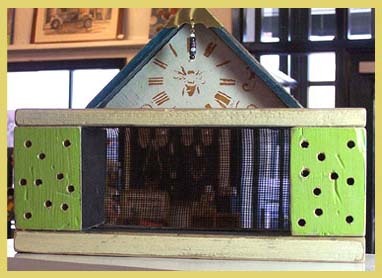 If the bird is a species that nests in a cavity, you can look up nest box plans online specifically for that species and build one. I’ve been successful in getting a Starling family to move to a homemade nest box after the babies fell out of a dryer vent. Observe the nest to see if the parents find the baby and start feeding it. If they don’t, take the bird to a wild bird rehab center. It’s hard to say how long you should wait before giving up on the effort to re-involve the parents. The necessary feeding intervals of baby birds can vary depending on how old they are – if in doubt you could call a wild bird rehab center for advice. It’s easy for baby birds to get dehydrated if they go too long without food because most of them don’t drink liquids but get their moisture from their squishy bug diet. Don’t attempt to give the baby bird water or liquids unless you know the right way – it’s very easy to accidentally kill a baby bird by giving it water without knowledge of the correct procedure. It’s time-consuming to make and observe a makeshift nest – if you have the time, you might find it worthwhile to put in the effort. You’ll learn a lot while doing it and it’s very rewarding! If you don’t have the time or the interest, just take the bird to the nearest wild bird rehab center right away. If it’s one of the three species not protected by federal laws (Pigeons, House Sparrows or European Starlings) the rehabber might either euthanize it or refuse to accept it. In that case you will have a difficult choice to make and having been in that position, I wouldn’t envy you! I chose to raise the five-day-old Starling I found in 2009 rather than let it be killed but everyone does not have the means or desire to take on the job of raising a baby bird. It can be done with the correct knowledge but it’s a big commitment. Raising a baby bird and releasing it to the wild later sounds like a good idea but is not an option if the bird has been raised alone and if you want the bird to survive – it will not have learned survival skills from the parents. It may not know how to act around other wild birds and could fail to be accepted by a wild flock. A protected species (not one of the three mentioned) is not legal to keep without a permit and you must take it to a licensed rehabber to help it. The baby birds on the left are nestlings and the other two examples are fledglings. If the bird is fully feathered and can run away and perch, it’s a fledgling. Most fledglings do not need any help. It’s not uncommon for baby birds to leave the nest before they can fly well. The fledgling will be somewhat vulnerable until it can fully fly but the parents should be feeding it and trying to keep it away from danger. The best way to help it is to put it on a perch off the ground (if you can catch it). If you have cats or dogs keep them indoors for a week or so. It’s not good for the health of pet cats to let them outside in any circumstances, but if you must let yours out try not to do so until the fledglings are flying. If you find a bird that is sick or injured, it will need care no matter what age it is, so in that case try to get it to a rehabber as soon as possible. If a bird does not look sick but has been caught by a dog or cat, it needs antibiotics within a day or so or it is probably doomed. When birds are to the point of showing signs of illness or injury they are in bad shape – their instinct is to hide their infirmity as long as possible so they are not caught by predators or rejected by their flocks. Speaking of sick birds, it is my understanding is that a thorough hand-washing after handling is sufficient precaution in case the bird does have something a human can catch, like Salmonella. I am not a vet or a scientist so get more information on diseases if you are concerned. Many bird-borne diseases are species-specific and can’t be caught by humans. However, if you have disposable gloves on hand it’s smart to wear them for extra protection. The best way to transport a bird to a rehabber is to put it in a box with soft nest-like materials and cover the box. Make sure it can breathe if it’s boxed or wrapped. The bird will likely be terrified and if it’s confined it will be less likely to injure itself. Handle it as little as possible and try not to expose it to loud noises. If the bird is really large, like a hawk, heron, goose or pea fowl (which I once rescued believe it or not! ), get advice from the Humane Society or other knowledgeable group before attempting to transport. My handling of the peahen I found went very smoothly but without good instructions and remembering to remain calm I might have had trouble! Some large birds can cause serious injuries with talons or beaks if not handled carefully. 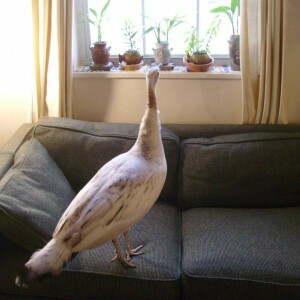 The peahen I transported had some mean-looking spurs but fortunately did not attempt to use them on me! I Found A Baby Bird. What Do I Do? 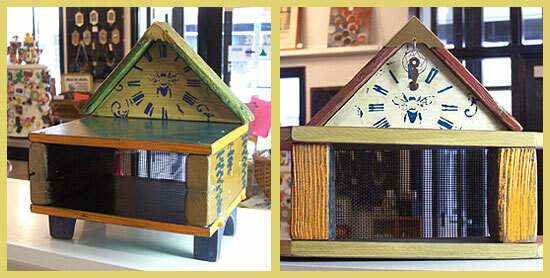 It’s becoming increasingly common to see structures called “Bug Houses” or “Insect Hotels” in gardens. Some people get squeamish at the mention of bugs or insects so perhaps the most appealing way to label such a structure is “Pollinator House”. 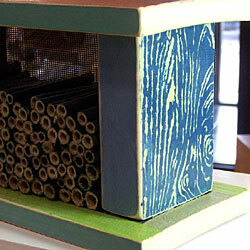 Such structures are provided as a nesting and sheltering area for beneficial insects. 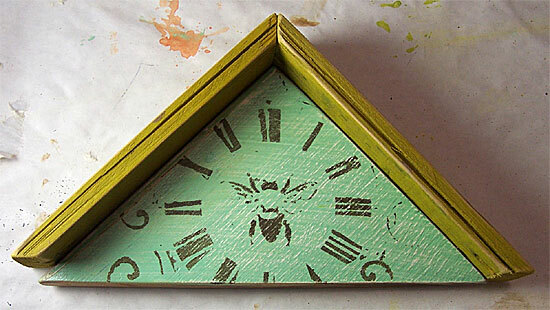 Most people are familiar with the pollinating actions of honeybees, bumblebees and wasps. Social bees and wasps are beneficial to the garden in many ways, not only by pollinating but in the case of wasps eating garden pests. It’s understandable to be nervous about the idea of having colonies of stinging insects living in your garden because some of these species are very aggressive about defending their homes. If you want more pollinators in your garden fortunately there are other bees and wasps that are easier to co-exist with peacefully. If you fear you have attracted the wrong kind of bee or wasp to your garden, I recommend getting help from an expert before deciding how or if to deal with them. I don’t mind bees and wasps because I can identify them and know how close I can safely get to them. I also don’t have any serious allergic reactions to stings. I work in the garden alongside Honeybees, Carpenter Bees, Bumblebees, Cicada Killers, Mud Daubers, Potter Wasps and others with little apprehension. Honeybees often land on me and I just stay still until they fly away. I steer clear of Yellow Jackets because I know from experience they will sting if you inadvertently disturb their nest (happened last summer in a client’s garden). I don’t attempt to eliminate them unless they are really in the way or other people are in danger. Even though I’m in the garden a lot I only get stung once every several years or so. The consequences for me are some brief anger, localized soreness and itching for a few days. The consequences for others could be far more serious and even deadly so use your best judgement. Many of the solitary species of bees such as Mason and Leafcutter Bees like to nest in hollow plant stalks or holes in old wood. We take away many of these potential nesting sites by cleaning dead plants and old wood out of the garden. Some amount of cleanup is necessary for human safety, aesthetics and homeowners associations but we can mitigate the effects of a too-clean garden by building a Pollinator House. As an added benefit you may get other desirable insects such as ground beetles and butterflies hibernating in the structure. The structure should be sturdily built to avoid toppling. 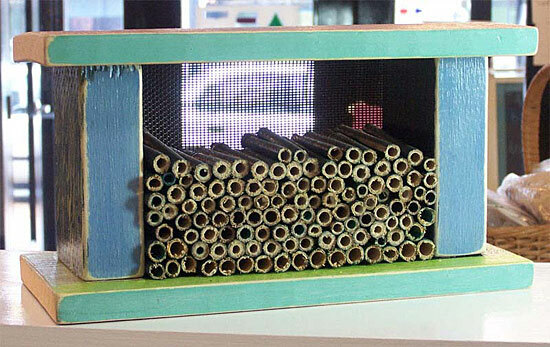 You can have a lot of fun designing your Pollinator House by creatively using materials, limited only by your imagination. I started a simple one for my Dad’s garden, custom designed to solve two problems for him. I bought 12 cinder blocks and used them to prop up the ailing fence. Then I filled some of the spaces with twigs and short segments of hollow, dead plant parts from the garden. I drilled some holes in some pieces of scrap wood. A variety of hole sizes and depths are good for different species. As we get more material we’ll keep filling in the spaces in the blocks. The result is practical and may not score high marks in the aesthetics department. However the fence is located in the middle of a mint patch (also a superb beneficial insect attractor) and it will be partially concealed by vegetation for much of the year. If Dad agrees I think I will add shelving to the top for containers of trailing plants which will help disguise the blocks. I will probably have to work on the bases of the cinder block towers to make them straighter since the ground here is soft and did some settling after I stacked the blocks. Dad is pleased that his fence is at least upright again and he’s happy to do his part for invertebrate conservation. Dad’s garden was designed with wildlife in mind and already supports an abundant population of beneficial insects. Hopefully my condo association will approve a Pollinator House in my garden. I don’t know what my chances are but I do know that my Pollinator House is going to have to be pretty to even have a prayer of getting approved. I guess I will have to make it portable so I can sell it if they say no! 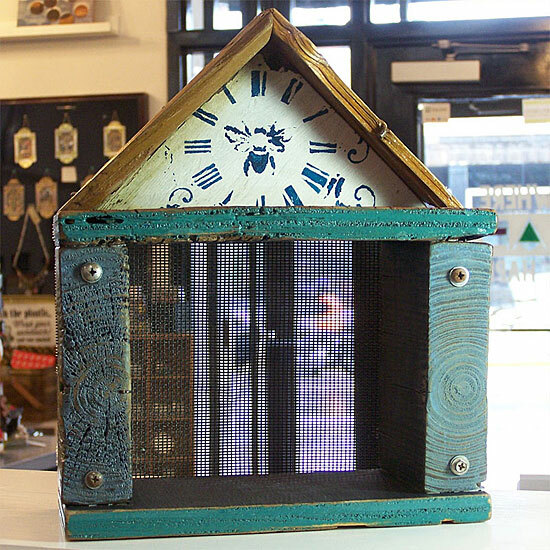 They have previously said yes to a bird house but a bug house might be a harder sell. 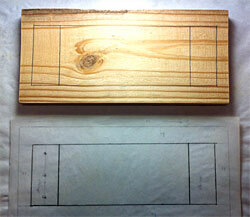 Stay tuned for a more aesthetically pleasing Pollinator House plan in a future newsletter! Depending on what kind of water feature you have, there are some winter preparations you should have already made because we are well into the season for freezing temperatures. However, if you do what I do and keep your small water garden from freezing with a bird bath de-icer, there is not much winter preparation that is necessary. Winter maintenance may be a little different, however. The de-icer I’m using does not keep the water at tropical temperatures, it just keeps it above freezing. I moved my live plants back inside in the fall because none of the ones I have would survive winter temperatures here. If you are warming the water in any way, you may see an increase in evaporation in the winter. Check your water feature frequently and top off with new water if needed. My current water garden fish are native Missouri minnows so they don’t need warm water – they just need at least part of the surface to be ice-free so they can get enough oxygen. If the water temperature is below 50 degrees, refrain from feeding your fish because they can’t digest the food as well and the water may get polluted. Fish are more sluggish when it’s cold and may be more vulnerable to predators – raccoons and several species of herons live in my neighborhood for example. If you don’t have an area already where fish can hide from predators, you may want to add one. You could use driftwood, rocks, artificial plants, artificial floating rocks, planting pots or anything you have on hand that is aquarium safe to build an underwater shelter. Keeping my water garden clean is very easy in the warm months – once a week I siphon debris off of the bottom with an aquarium gravel vacuum and change 20% of the water. As I do this I also rinse out the sponge filter. My water garden is small, only 30 gallons, so this is just as easy as maintaining an aquarium. Larger water gardens would need to be managed differently. In the cold months vacuuming the bottom is not a very pleasant job so I don’t do it as often. It’s probably not as necessary in winter with the fish eating less, but you should regularly clean the filter if you have one and if you run it in winter. Periodically sweep debris out if possible with a leaf skimmer or net. If birds like to drink and bathe in your water feature they can cause a water quality issue with their waste and by dropping food in it, as can decomposing leaves and plant parts that fall in. If you have been doing any reading about gardening lately, you have probably encountered many articles urging people to plant milkweeds for Monarch butterflies whose numbers have declined at an alarming rate in recent years. At the risk of bringing up a topic again that is already well-covered, I will mention milkweeds because right now is a great time to plant them. Milkweed seeds need a period of cold in order to germinate. Last year I simulated that effect by cold-stratifying Common Milkweed and Swamp Milkweed seeds in the refrigerator – a successful effort that resulted in many new plants. This year I’m going to use nature to accomplish the task. The photo above shows a Monarch caterpillar on the left and monarch chrysalis on the right on swamp milkweed in my garden. My proudest garden achievement of 2015! The most recent issue of Missouri Conservationist has a timely article about planting milkweeds. They recommend planting the seeds outdoors in January or February in weed-free bare soil. Press the seeds into the soil. If planting into pots, sprinkle 1/4 inch of soil on top of the seeds and press down. Place the pot in a sunny exposed area and water regularly after the seeds sprout. Transplant after the plants have two to three sets of true leaves. If you start milkweed seeds this winter you will probably not get any flowers from your milkweeds until next year, but caterpillars can still use them as a host plant until then. Try planting some annuals among them to add color and hide leaves that caterpillars have chewed until you get blooms. When they do flower, get ready for quite a show of winged visitors! Schnarr’s carries three varieties of Milkweed seeds – pick some up now to improve your habitat!